What an incredible golf course! If you are into elevation changes and spectacular golf course scenery - from tee to green this is your course. 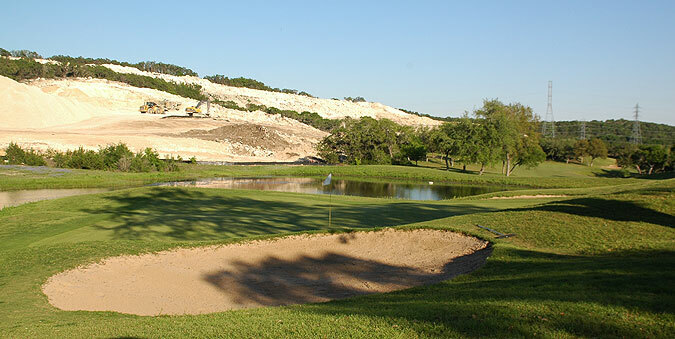 Cedar Creek in the northern hills northwest of the San Antonio Airport, is a gorgeous championship design that is priced in a range that makes it a special golf value - and in our opinion - a MUST PLAY for those visiting the area. Located off the 1604 just west of I-10, it is worth the drive from anywhere near town! The opening hole, a par four that begins from an extremely elevated tee, will give golfers a glimpse of what they can expect throughout the round. The topography is very hilly, with frequent elevation changes and dramatic shot values, particularly off the tee. On the front nine, many of the narrow, tree lined fairways are ravine like, with slopes on both sides that create a bowl effect, funneling tee shots towards the middle. Hole number three is a short par four that plays uphill all the way, finishing with a dramatic approach to a raised green complex highlighted by a clear, cascading stream that is situated along the left side - simply awesome! The back side is even more challenging. Most of the fairways are sloped from one side to the other, making it difficult to stay down the middle. Mounds and mogul like undulations also create some uneven lies and funnel shots into collection pockets The 13th is unique with 3 grass bunkers about 150 out - near the landing zone of this mid-range par four. Number 18 plays uphill off the tee to a fairway that severely slopes left to right before heading downhill. The beautiful raised green complex is framed by a rock wall that rests behind. The challenge is in finding the correct positioning off the tee, then playing the approach to the preferred level of the mostly tiered, sloping greens. Four sets of tees afford opportunities to play from distances and slopes measuring 7150 yards/132 slope, 6660 yards/125 slope, 6140 yards/118 slope and 5525 yards with a slope of 113 from the forward tees. Yardage blocks are posted on the fairways at 100, 150 and 200 yards. Measurements are also visible on the cart paths and color coded flags indicate front, middle and back hole locations. Sand bunkering is a bit understated with 27 in total, and water comes into play on just 3 holes, but these hazards are not really needed to make this an interesting experience. The terrain is the main challenge, and some of the tiered, ridged putting surfaces also demand a good short game. On property is a grass range and practice green, and the clubhouse has a pro shop, locker rooms with showers, and a spacious snack bar/lounge with picture windows that provide spectacular vistas. This is a gorgeous golf course, with some beautiful holes and outstanding scenery throughout. The conditioning from tee to green on our early spring visit was outstanding. We highly recommend a round here - with a great pricing structure, this is a wonderful vale, and certainly worth the short ride. For more info, visit our page for the property, with direct link to their website by clicking here.